Since I’m not much of a Scotch cocktail drinker, my recent addition of the Affinity to my short repertoire of Scotch whisky-based cocktails was sort of a surprise. In addition to giving me another option to do up for my Scotch-drinking friends, this one gives me an alternative when the smoked salmon is out for hors d’oeuvres. Properly made, it is a very pleasant drink. 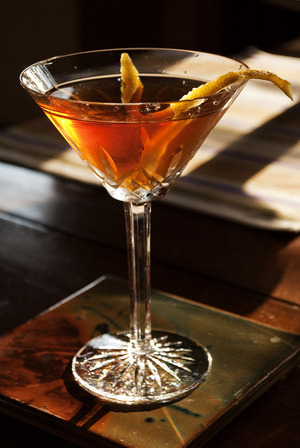 Nearly all references that list the Affinity agree on the ingredients—Scotch, dry vermouth, sweet vermouth, and bitters—and there seems to be widespread agreement that the whisky and each of the vermouths should be in equal portions. As for the bitters, they can be orange, Angostura, or both. David Embury, in The Fine Art of Mixing Drinks , follows his usual philosophy of applying a generous (some say heavy-handed) prominence toward the main liquor; that bias leads him to a 4:1:1 formulation, which for him equates the Affinity to a Scotch-substituted perfect Manhattan (or “medium” Manhattan, as he puts it.) William Grimes endorses this version in his amusing history Straight Up or On the Rocks . The equal parts recipe seems to be the mainstream version. If you use a relatively bland Scotch, it might even be a Scotch Cocktail For People Who Don’t Like Scotch. Those who appreciate Scotch more avidly than I can accentuate the Scotchness of the blend by using increasingly more flavorful or aggressive whiskies, or by taking a cue from Embury and upping the proportion of whisky in the drink. I tried both of these strategies, and both easily brought the whisky strikingly to the fore, rather beyond my tastes. Combine all ingredients and stir with ice. Strain into a chilled cocktail glass. Express and garnish with lemon. “Affinity Cocktail” at cold-glass.com : All text and photos Copyright © 2010 Douglas M. Ford. All rights reserved. The equal parts version is even better with a nice cask strength Scotch! Unfortunately, Asyla has gone up a lot in price in the last few years, so I am not sure I still recommend it quite so highly. I still like it, but you can buy a decent single malt for about the same money. As far as Cask Strength, The Macallan Cask Strength is a good general purpose Scotch to have around the house. Macallan is a favorite of my bride and some of our Scotch drinking friends, but I haven’t tried the cask bottling. It seems like a good thing to forage into the pantry. And maybe the Asyla, too. Thanks for the ideas, I’m looking forward to trying these.